When Sydney-based architect Ian Bennett was briefed by his clients to design the home of their dreams in Sydney's inner west, the choice of materials was never really in doubt. "My clients own a concrete formwork company" he off-handedly remarks. And while that in itself, made the decision pretty obvious, it was one of concrete's chief characteristics that really got it across the line. "They wanted a house that was zero maintenance, and concrete is about as low maintenance as you can get," Bennett says. "It provides structure and finish all-in-one." The aptly named, Concrete House inhabits a quiet cul-de-sac, opposite a park and surrounded by 50's and 60's red brick cottages. From the street, it's clear how the house got its name. 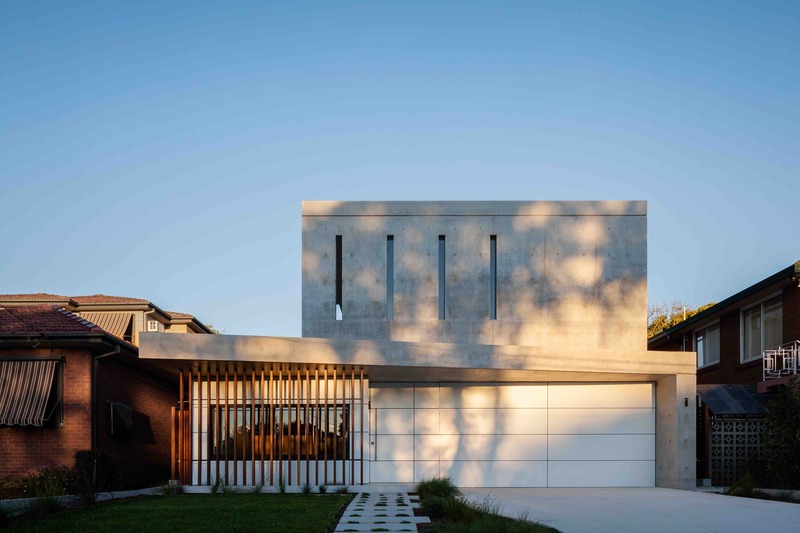 Its off-form, insitu concrete facades give the home a commanding, almost monolithic presence. Indeed, the upper levels presents almost entirely as concrete, punctuated by four narrow, vertical windows that admit just the right amount of light to the adjoining bedroom (without exposing it the full heat of the western sun). However, Bennett is not one to overplay his hand. As counterpoint, the ground level façade features aluminium composite panelling, a large horizontal 'picture' window and vertical timber slats - providing visual relief and balance to the streetscape. Above the ground-level window and entranceway, a generous concrete eave slants from south to north to provide additional shading and weather protection. Around the northern corner, the transition to aluminium panelling continues, both on the upper and lower levels. The upper level has large windows protected by wide concrete eaves, designed to capture the northern winter sun and views to the park from the bedrooms. The rear of the house is a testament to Bennett's considered and clever response to the owners' brief - to create a generous, ground-floor living space around the pre-existing, in-ground pool. He's done so by designing a covered, outdoor terrace that provides a seamless connection from the kitchen/living area to the pool. Again concrete is the dominant feature. The entire ground floor of the home features a burnished concrete floor that extends out onto the terrace, while overhead the concrete roof plane extends out from the house and over the top of the outdoor area. The piece-de-resistance in this outdoor space is a large, retractable glass skylight. Not only does it admit light into the kitchen/living space, it effectively doubles its size. On a summer's day, the bi-fold aluminium doors separating the two spaces can be fully opened, as can the skylight, to create a wonderful, extended entertaining area. Should it rain, the glass skylight can be retracted to weather-proof the terrace. Elsewhere inside the home, concrete is used judiciously - and in balance with other materials - as interior wall classing, including for the stairs and stairwell. Bennett says the owners originally favoured a Class One finish for the exposed concrete surfaces, but took little convincing to opt for the rawness of off-form finishing. "The beauty of concrete is its imperfections," he says. "The aluminium panelling provides the 'perfect', manufactured finish. You need something to contrast that, and off-form concrete does it beautifully." The end result is a home that is as stunningly beautiful as it is comfortable and practical - a statement for contemporary, urban living.